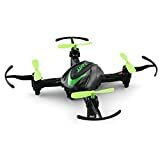 · ❤ The quadcopter can fly indoors and outdoors. Includes a 4CH digital proportional RC system; It can perform 3D movements in four directions with 4 LED lights. · ❤ Charging time: about 40 minutes; Flight time: about 5 minutes; Control distance: 25m.